Paperback, 8.5 x 11 in. / 60 pgs / 18 color / 5 bw. In 1990, when Keith Haring died of AIDS at the age of 31, The New York Times detailed a "meteoric career" that was built around a "cartoonish universe inhabited by crawling children, barking dogs and dancing figures, all set in motion by staccatolike lines." 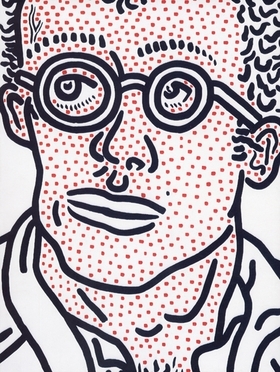 This volume, published in honor of the fiftieth anniversary of the artist's birth, serves as a survey of some of Haring's best known works--taking the viewer through the three stylistic turning points of his short yet impressive career. First, we are presented with the cartooning influences, where thick bold lines are laid down with ink on paper or drawn directly onto empty subway posters. Next come Haring's most iconic works, fully developed by the mid-1980s, when he began to work directly on canvas. Finally, we come to work that hints at Haring's own social awareness and fight against AIDS--the depiction of intentionally unfinished canvases and devil-like figures, for example. FORMAT: Pbk, 8.5 x 11 in. / 60 pgs / 18 color / 5 b&w.